Easter brought warm temperatures, fresh fava beans (obligingly shelled by the Long-Suffering Husband) and a chance to sit on the screened porch–at last! I can recommend the Louis Jadot Mâcon Villages Chardonnay 2012 ($12). It’s a classic unoaked Chardonnay with plenty of fruit and floral aromas, very easy to drink and great with mezze, salads, and cheese! Cheese!!!! Save me some, Agnes!! You had me at cheese. With chocolate, they are the essential food groups! What a gorgeous festival of small plates! I see a dish in the back that looks very much like Greek gigantes…I love mezze! I am passionately devoted to mezze, and yes, those are gigantes! We have a specialty store here that cooks up an irresistible recipe. I still haven’t figured out where they get their flavorful peppers. Many thanks for the comment! Yum. I bring home a couple of kilos if dried ones when I go to Greece, but I have yet to find anyone local who has them. I love them stewed with tomato, garlic and a hint of fresh dill. Thanks! It’s our favorite part of the house, and we miss it terribly during the winter. So do the cats! 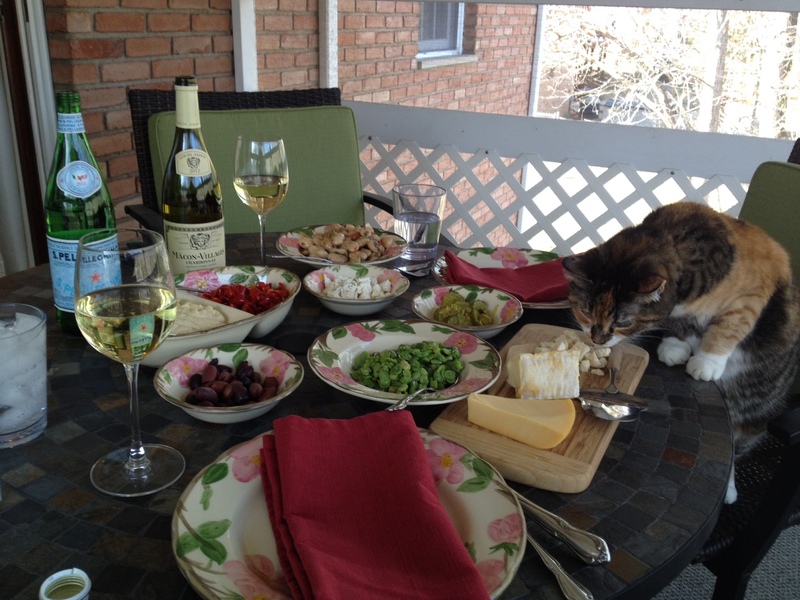 We enjoyed favas too with a roast turkey and good rose champagne to ring in the warm weather! Cheers! Sounds great. Note to self: rosé champagne!!! Reminder – try grilling favas in the shell. Your table looks like just the kind of grazing feast I love. Happy Easter ( it’s still a celebratory week here in Mexico). Yes, we are just getting warm enough weather to do some grilling. Favas will definitely be on the menu!